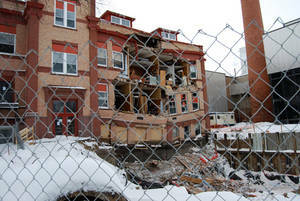 Minard Hall, which is undergoing renovation, had a partial collapse early Sunday morning. Campus police responded to the scene at 3:00am. 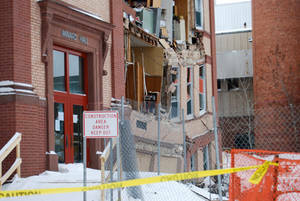 No one was in the building during the collapse. Minard Hall is closed until further notice. 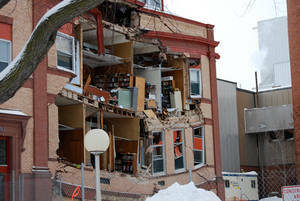 Sometime between midnight and 3 am on Dec. 27, part of the northwest portion of Minard Hall collapsed. NDSU police patrolling campus found steam rolling out of the north side of the building. No one was in Minard at the time. 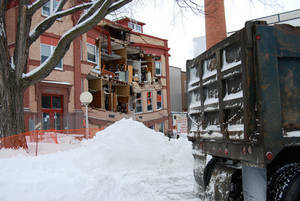 Excavation work was being done on that side of the building by Meineke Johnson Construction as part of the $18 million Minard Renovation Project. Bruce Franz, NDSU director of facilities management met early Sunday morning with structural engineers from Heyer Engineering, soils consultants from Northern Technology, contractors from Meineke Johnson, and representatives from JLG Architects, all of Fargo. A company that specializes in structural shoring will be arriving to campus tomorrow. In the meantime, construction workers are clearing debris and filling the excavation site engineered fill. No one will be allowed in the building until further notice. Franz says they will do whatever can be done to save personal and professional materials for those whose offices were damaged. "However, we need to make sure the foundation is stabilized before we can determine if we can safely retrieve materials," Franz said. Wow, there are a lot of uninformed NDSU haters on the Forums website... just sad. If you would like to see even more pictures take a look at http://pecanpie.smugmug.com/Other/Minard/10774223_ASDon#750982095_PrEUH ... they include some of much higher resolution. 1. 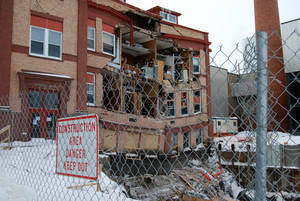 The general contractor on the project has stabilized the area where the support column gave way. 2. Bruce Frantz, Director of Facilities Management, along with folks from Heyer Engineering and JLG Architects entered Minard Hall this morning to assess the structural damage from the inside. The damage is contained to the north tower, including English offices on the third floor, the Dean’s suite and the Office of Institutional Research on the second floor and Psychology labs and offices on the first floor. We are making plans to provide space for up to 45 offices. The north east tower of Minard, along with the adjoining staircase appears structurally sound but will be tested further. 3. All of Minard Hall is closed to faculty, staff and students until further notice. We have temporary heat in the building and we are working to provide permanent solutions for the utilities. For those of you with offices in the primary damage area, we cannot allow you into that area. We are examining ways we can safely retrieve your personal and professional items. I can promise that we will do our best to retrieve your materials for you. Provost Schnell and a team of individuals are looking into solutions about office and classroom space. I just spoke with Dr. Schnell and they are making good progress. We expect to have offices ready for you in a week and the classroom situation resolved by next week. In the meantime, for those of you without access to your office, please call the IT Help Desk. The folks there will help you get your calls forwarded to another line and answer any IT service issues you may have. The number is 701-231-8685 (option 1). I want to thank our excellent staff for their work on this isse. Please know that we are working together to make sure the needs of our students, staff and faculty are being addressed. An update will be provided as soon as we have new information. That was quite outspoken. I'm sorry that they feel they need to give up on the students of North Dakota. It was, of course anonymously. It is too bad that they are giving up, do they really think that higher ed is that far gone? I think it still goes back to what the purpose of higher education is--is it to educate undergraduates, or to make money and prestige for the school, or is there a balance between teaching and research? The deal with public universities is that they want to be able to offer everything that private universities have (in terms of quality of life), but where they should be competing is in educational value: how much you know when you leave, how confident you are in the job market, and how innovative you can be to solve the world's problems. This means competing with private schools by having smaller classes, having faculty spend more time teaching and less time researching, and imparting to the students a sense that they are there to a) learn how to learn and b) use those learning skills to develop some degree of expertise in a particular field, NOT that they are there just to get a diploma. Unfortunately, when public universities are the cheapest available (for good reason, they are there to educate the public), they attract people who would rather buy a degree with the least amount of effort possible. I don't think higher ed is that far gone, but I think some schools have lost the balance between education, research (as a fundraising tool) and sports (as an advertising tool*). This professor seems to be saying that his or her research is more important than educating his or her students (by whinging over lost offices etc.). It's granted that to teach you need a place to work and materials with which to create your lessons, but I get the sense that he or she is saying that "because I don't get to do my research, I don't really care about teaching now," which confounds the rest of the argument that higher ed is being left behind in North Dakota. I couldnt agree more, especially with a) learn how to learn and b) use those learning skills to develop some degree of expertise in a particular field, NOT that they are there just to get a diploma. That is simply not happening anymore, like it should be (similar to the discussion in the other topic: http://talk.campusdakota.com/index.php?topic=4913). Educating students, actually educating them as opposed to just teaching classes needs to be looked at. In my opinion it is getting lost a lot of times as professors focus on many other things including research (and not necessarily a fault of their own) as is the case with administration just looking at growing numbers and revenues over quality (of students, education, etc.). As a grad student looking at an advanced degree, research is part of the game because it's my primary interest, but I can see your point. Having large research universities require all faculty to "publish or perish" instead of allowing some faculty to focus on education is bad for those who wish to teach at those schools but either a) have more interest in education than research, b) feel an obligation to improve the education at those schools, or c) are left with little choice due to other circumstances (location, etc.). It's bad for the schools as well because they lose out on those undergrads who could be the best research collaborators while undergrads, which would even enhance their missions as "research schools." These are students who know that they want an education, know that they want opportunities, and so they find a school that will offer more than just a diploma. Good point. I agree that research is very important, it pushes our world forward. Of course I dont think it should be done at the expense of education. The better thing would be to mix both together. Have useful research be part of the curriculum where appropriate.